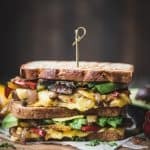 Since going gluten and dairy free (for medical reasons) about 7 years ago, we haven’t often enjoyed a really good sandwich – for a while, we simply avoided bread as a whole due to a lack of high quality brands at our local store. When we discovered Canyon Bakehouse a few years back, it was a godsend; gluten free bread that actually tastes good? A miracle! Even better, they’ve continued to improve their products over the years and have come out with some fantastic gluten free products, including (recently released) english muffins, focaccia, bagels, buns & more. Nowadays, we make sandwiches all the time – they make for an easy, no-fuss lunch, and Canyon Bakehouse has come out with a few flavors of Heritage Style wide loafs, which are perfect for huge, messy sandwiches (like this one!). We’ve had this recipe idea in mind for a quite a while; it’s such a comforting mixture, yet surprisingly healthy. We sautéed a mixture of garlic, jalapeño, red onion, bell peppers, mushrooms & some spices, which are held together in the sandwich with vegan cheese slices & avocado. Speaking of vegan cheese, we absolutely love these slices – they actually melt (if you’ve tried vegan cheese, you know what we mean), and the taste truly resembles their cow’s milk counterpart. 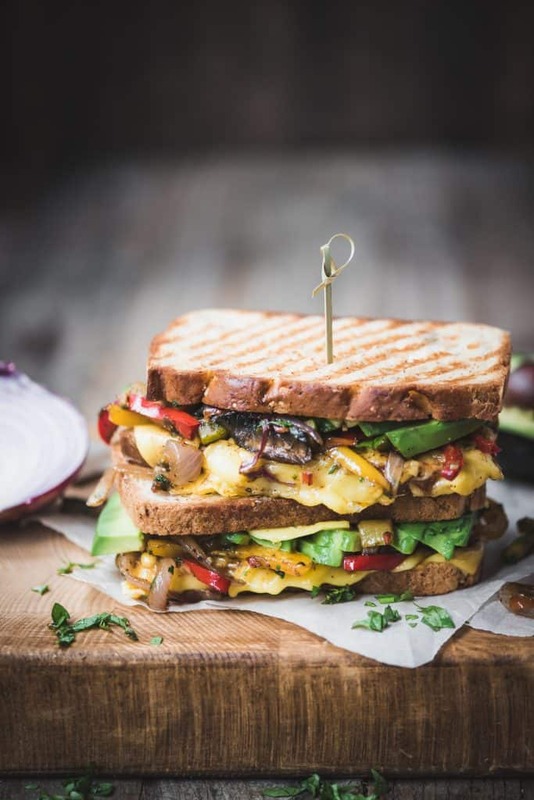 If you, too, happen to be gluten free yet love sandwiches, check out this Canyon Bakehouse recipe e-book; so many great recipes (including one of ours ;))! 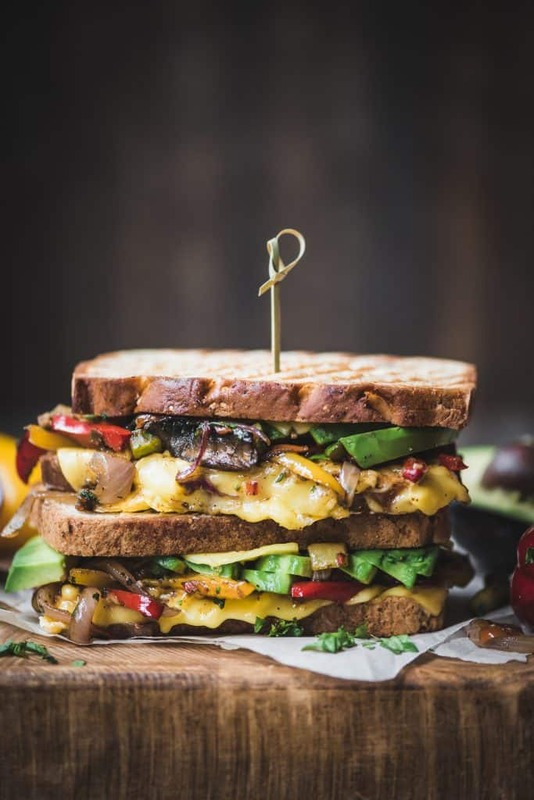 Sautéed fajita veggies + vegan cheese + gluten free bread = my idea of the perfect lunch! Sauté garlic, jalapeño and onion in olive oil over medium until softened and fragrant (stirring frequently to prevent burning) . Add chili powder, mesquite, cumin and salt, stir to coat. Add the peppers, mushrooms, and zucchini and sauté until all vegetables are softened. Brush oil on both sides of each slice of bread. 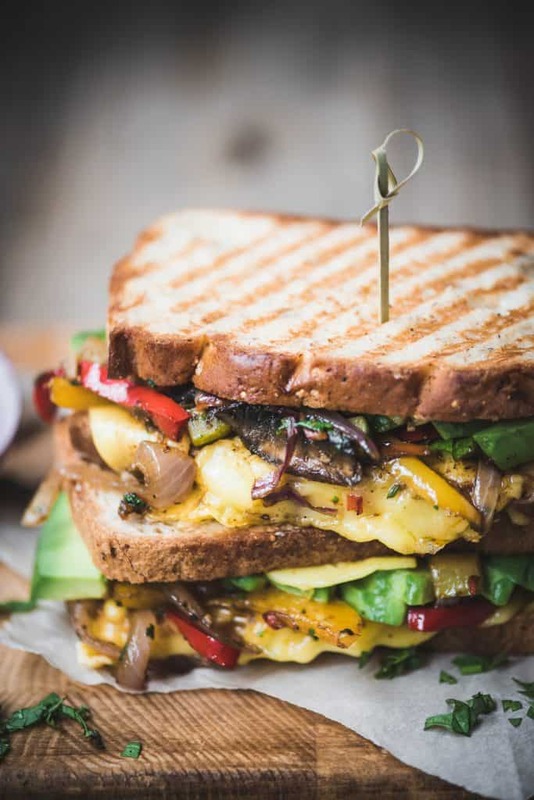 Start with a layer of vegan cheese, then sliced avocado, and then a layer of fajita veggie mix to sandwich and press in panini press until cheese is melted. If you don’t have panini press, cook in a regular fry pan, placing a lid on top of the sandwich to lightly press down. Flip sandwich halfway through cook time to prevent burning.